Science fiction isn’t the only source of comically weird predictions about what we’ll be eating in the future. Great (and not-so-great) minds in journalism and science have also spent a century forecasting the demise of meat and vegetables and the rise of foods in a pill — which always seem to be 50 to 100 years away. 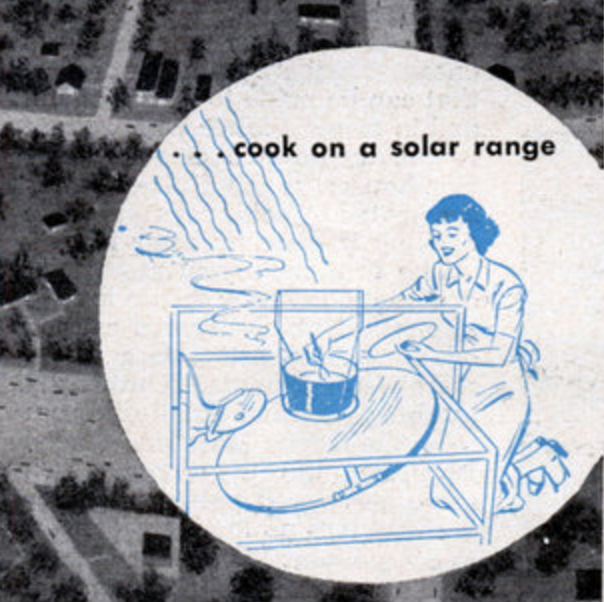 And then there were all those technological advances that were supposed to free women from the drudgery of cooking (never mind that men could pick up a spatula, too). Here’s a look back at the future. For McClure’s Magazine, writer Henry Dam interviews one Professor Berthelot, who claims that in the year 2000, “the epicure of the future is to dine upon artificial meat, artificial flour, and artificial vegetables; drink artificial wines and liquors, and round off his repast with an artificial tobacco.” But, the professor says, “I do not say that we shall give you artificial beefsteaks at once, nor do I say that we shall ever give you the beefsteak as we now obtain and cook it. We shall give you the same identical food, however, chemically, digestively, and nutritively speaking. Its form will differ, because it will probably be a tablet.” Scholars and sci-fi writers have been predicting meals-in-a-pill ever since, but we’re no closer to this vision, thank goodness. Ladies’ Home Journal publishes a now-famous article predicting that farmers will cultivate giant produce: strawberries the size of apples and “cantaloups” that can feed an entire family. They will also electrify soil to “make valuable plants grow larger and faster, and . . . kill troublesome weeds.” In addition, cows and sheep won’t have horns as a result of being bred solely for meat. The article correctly predicts the use of grow lights, and while our livestock did not shed their horns, our breeding of turkeys since the 1950s has, in fact, resulted in birds with oversized breasts. The science-fiction writer Robert Heinlein pens a piece (published three years later in Galaxy magazine) saying that “fish and yeast will become our principal sources of proteins” as beef and lamb become scarce. Popular Mechanics publishes a story about the “miracles” of the year 2000 by Waldemar Kaempffert, the New York Times’ science editor. By that year, he says, food will be made from sawdust and wood pulp, and used underwear will be recycled into candy through the magic of chemistry. According to Southland magazine, radioactive fallout from the inevitable atomic war will lead to giant vegetables (carrots three feet long! tomatoes the size of basketballs!) that will be cleaned with a “radiation trap” before going to market. According to U.S. News & World Report, by 1990 we’ll all be eating “seaweed, ocean algae [and] synthetic protein.” The article also predicts that we’ll have milk that can be kept at room temperature, which wasn’t too far off — ultra-high-temperature pasteurized milk, which is shelf-stable until opened, hit the market in the 1970s, though it is much more popular in Europe, where refrigerators are generally smaller and unopened milk more often lives in the cabinet. In “Future Food,” Barbara Ford, a former science editor, imagines that in the not-so-distant future, we’ll eat insects for their high protein value and low cost. Insects are already widely eaten in other cultures, but they’ve been a tough sell in the United States. A Brooklyn start-up did begin selling cricket-flour protein bars in 2013; flavors include apple cinnamon, blueberry vanilla, cacao nut and peanut butter and jelly. While beef prices are rising, they’re not yet high enough to direct consumers en masse to cricket burgers. Curt Jones, a microbiologist by training, invents Dippin’ Dots, which eventually sport the tagline: “The ice cream of the future.” An article on the satirical news site the Onion a few years ago envisioned a 22nd-century time traveler visiting our present and verifying that, yes, Dippin’ Dots are the only type of ice cream our descendants eat.